Then thought had made yummy Rava Sabudana Wada they before yesterday so why not start with that..
First of all I soaked the sabudana in water since morning so you will have to plan for this recipe from morning... Keep in mind- Put exactly 1 cup of water to 1 cup of sabudana. Also soak rava in curd 3-4 hours before the preparation. Then put sabudana in soaked rava. Mix them well. Put cumin seeds, chopped coriander, finely chopped chilli, garlic and ginger and add salt as per you taste. Mix it all well to form a batter. Take a frying pan to deep fry the wada. 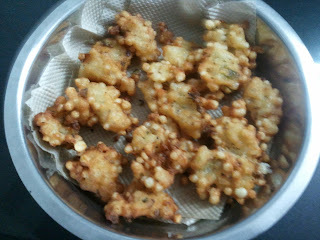 Use fingers to drop the batter in the oil to form fritters. Deep fry till they turn golden brown on from both the sides. Remove them on to a absorbent paper.